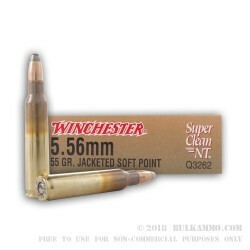 This entirely lead-free and non-corrosive round from Winchester features a copper jacketed knurled tin core soft point 55 grain bullet that will mushroom upon impact without sacrificing as much penetration as a comparably sized hollow point. It further offers an easily removed and replaced heavy metal free Boxer primer with a waterproofing lacquer coating, brass casing with Black Lucas applied around its mouth, and clean burning propellant that reduces the accumulation of excessive powder residue. 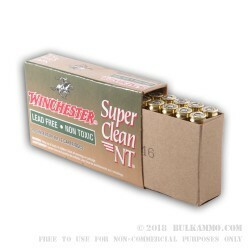 This Super Clean NT round averages only 85% of the felt recoil of a comparable conventional duty round. With a muzzle velocity of 3,050 fps this round is suitable for personal protection, varmint hunting, and target shooting. It meets the requirements for reliability and accuracy dictated by the FBI’s standards for their training and active duty ammunition. 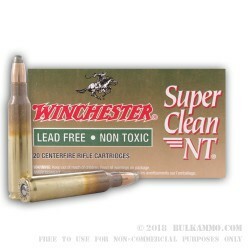 It is backed by the high quality that Winchester has emphasized in all of their products since their establishment in 1873.